Heather Hoch When it comes to breakfast at Nook, simplicity is the key. Open: Monday-Friday: 8 a.m.-2 p.m.; Saturday-Sunday: 8 a.m.-3 p.m.
Breakfast doesn't always have to be complicated. While upscale spots tend to tout a few culinary buzzwords on their morning menus to jack up the price, simple, straightforward breakfast offerings are absolutely nothing to sneer at. Downtown's more recent breakfast, brunch and lunch spot, Nook, seems to have found the middle ground between greasy diner and fancy brunch. While the restaurant has a full mid-day menu of sandwiches, salads and more, I'm sticking to the breakfast and brunch menu here to stay focused. With dishes ranging from $5 to $10 in the morning, Nook is competitively priced and a good option for those not looking to spend $15 on a brunch plate—which isn't unheard of downtown. Although the prices aren't high, Nook isn't skimping on quality. Those looking for a locally sourced meal, down to the EXO Roast Coffee, will not be disappointed. One of the more unique highlights of Nook's menu is the "Healthy Start" options, which serve up lighter dishes that won't weigh you down the rest of the day and run between $5 and $7. In pop culinary circles, avocado toast is definitely having a moment, and Nook has jumped on the trend, embellishing theirs with bright orange and spicy radish and chiltepin. Light-minded diners can also opt for a veggie frittata, yogurt parfait and sweet quinoa with berries and almonds. Also on the lighter, inexpensive side of the menu are the crumpet sandwiches. Turkey sausage, an over medium egg and cheese; bacon, arugula, tomato jam and an over medium egg; or folded eggs with manchego and chives come between freshly made crumpets. While the serving size and concept were exactly what you'd want for about $7, my crumpet was only partly cooked, leaving a pasty, doughy center. 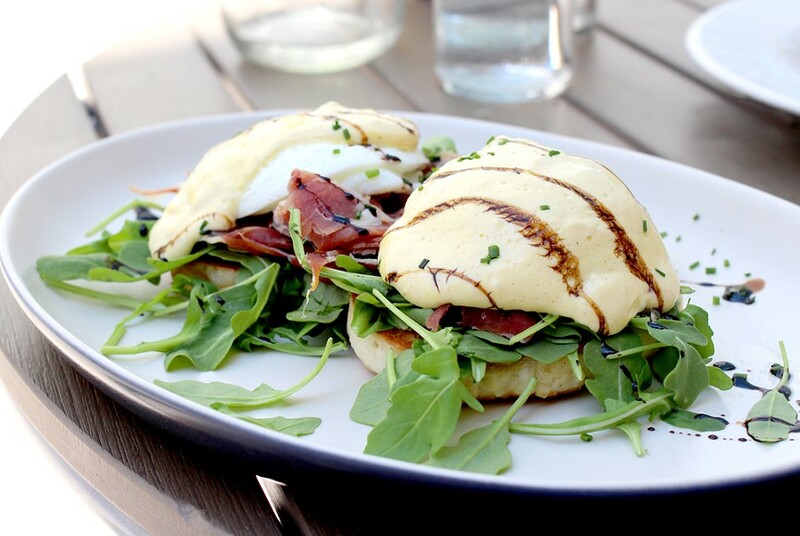 The Godfather Benedict adds Italian flavor to the classic brunch dish. The crumpets are also used on both Benedict options, which come open-faced and griddled, eliminating any uncooked crumpet portions. The Godfather Benedict ($10) offers salty prosciutto, peppery arugula, hollandaise and balsamic to add an Italian twist on the classic dish. However, by the time my Benedict reached the table, the hollandaise had formed a sort of butter shell around my eggs, synthesizing my main beef with the typically lovely spot. Service at Nook is slow. Whether it's weekday breakfast with just a few other diners or a packed house at weekend brunch, you're liable to be left waiting longer than you'd like to be. For weekday breakfast, this makes it difficult for the downtown business crowd to justify popping in before work because it could mean being more than a little late into the office. For brunch, I'll admit, I tried to be a lot more mellow. After all, it was completely full in the beautifully remodeled restaurant with a few stragglers even dining at outside tables. However, 45 minutes between sitting and getting food is extreme for any breakfast and it just felt like we were being ignored more than waiting on the kitchen to catch up with the bevy of orders—half of the wait time occurred before we even ordered. Once the food did arrive, we had to ask for cutlery, napkins, water and more coffee, which only added to the frustration. Although the service could use some help, when Nook owners Nikki and Matt Thompson say the restaurant is a labor of love, it's clearly true. There wasn't a single visit I made where I didn't see Nikki running the floor to help where she could, but it still didn't seem to help her servers enough to get them on track. That's why being met with that cold hollandaise on my Benedict was a sticking point. The flavor in the dish was there, though, and admittedly in all of the other dishes I've tried at Nook. Once it makes it to the table, you're likely to start feeling a little less grumpy, if nothing else. Case in point, the simple biscuits and gravy ($8). Fluffy biscuits are doused in lightly spicy pepper sausage gravy and topped with two eggs cooked to your preference. While being likely the least visually appealing dish on the menu, the dish offers comforting diner food expertly elevated without convoluting. Similarly, the folded eggs ($7) are basically a standard omelet with ham and cheese, jalapeno and bacon or dill and gravlax. Unlike an omelet, though, the folded eggs also find their way into huevos rancheros with beans, salsa and tortillas. The "Something Sweet" section offers the fluffy house griddlecakes ($7) served three ways: chocolate pistole, cinnamon roll or with seasonal fruit topping. Right now, the tart blueberry compote will put any desire for syrup out of your head while the light cakes will keep you diving in for subsequent bites. For strict brunchers, the lemon oil-topped lox with dill cream cheese on pumpernickel ($8) offers a bright, herby take on breakfast, while the Dani's BCLM ($9) uses a robust loco moco base of rice, hamburger patty, fried egg and brown gravy, giving it a little breakfast nudge with bacon and American cheese. Seasoned hanger steak and eggs kicks off the morning with hearty flavor. Somewhere between those two options is the hanger steak and eggs ($10). 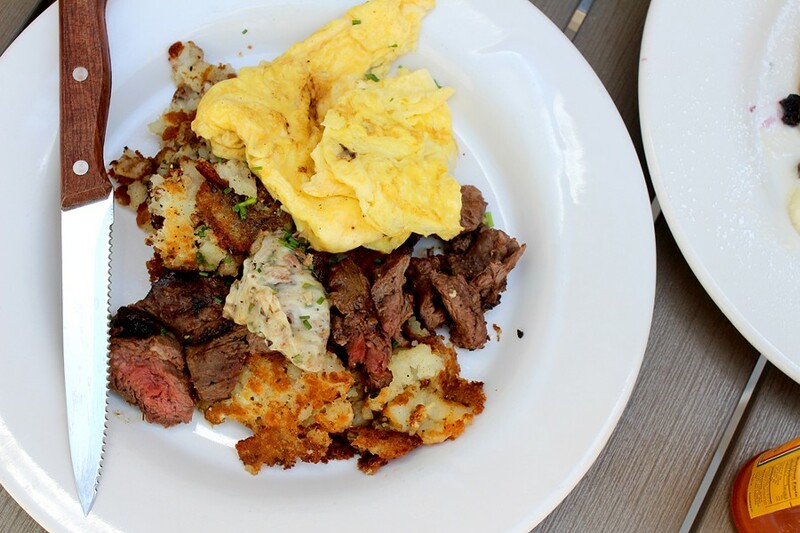 Served with two eggs, bacon-studded butter and the restaurant's signature "smashed hash" (get this as a side no matter what you order), the flavorful, spiced slices of hanger steak offer a hearty morning meal. Unfortunately, while the steak tasted great, when a friend ordered it medium, it came to the table medium rare with a few pieces more rare than anything. 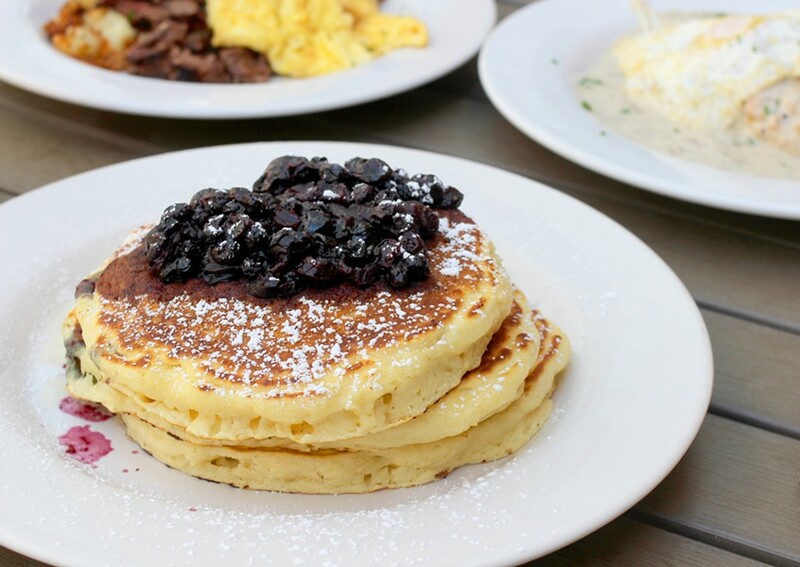 Overall, Nook offers breakfast basics with a little local flare for reasonable prices, and, although the service left much to be desired, it is worth checking out for an easy breakfast—especially if you're hunting for something lighter..